Click on small image to view full size. Marine Turbine Technologies (MTT) of Franklin, LA and Bryant Enterprises of Maryville, TN have teamed up to develop a concept turbine outboard powered high performance bass boat. 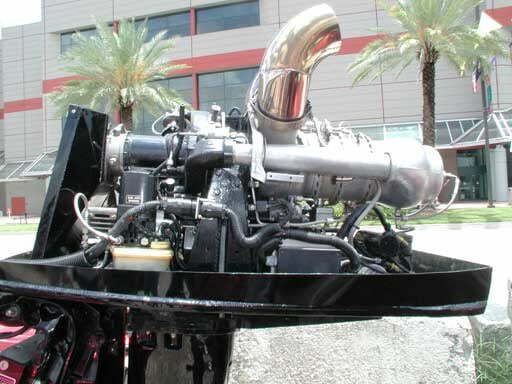 The experimental outboard features a Rolls Royce Allison 250 series gas turbine engine mounted to a Mercury Racing 2.5 EFI Offshore outboard center section and 1.62:1 gear ratio Sport Master gearcase. This one-of-a-kind turbine outboard-powered Stroker bass boat will undergo tests in the near future in preparation to set a new American Power Boat Association (APBA) world bass boat speed record. Overcoming water resistance requires the continuous operation of marine engines at 70 percent or more of their full power in order to maintain cruising speeds. Similarly, aviation engines also experience continuous operation above 70 percent of their available power in order to keep an aircraft flying. Current availability of surplus aircraft turbine engines, which can be refurbished at reasonable cost, has brought turbines into the marine propulsion picture. The turbine engine, designed to run continuously at high power settings and on multiple fuels, is very reliable due to no reciprocating parts. In addition, it provides a higher power-to-weight ratio in a smaller size than either diesel or gasoline engines. for gasoline powered outboard motors. of marine turbine installations and often is referred to as the marine turbine experts. Their engines have been featured in several government demonstrations to promote the feasibility and benefits of using turbine engines in government patrol boats and various military craft. Bryant resides in East Tennessee, where the high performance bass boat originated. His goal was to build a boat that not only performs well at high speeds but one that can also handle rough water and is stable in tight turns. After two years and thousands of man hours, the Stroker bass boat hull design was completed. The high performance 21-foot boat, with an exceptionally wide 94 ��-inch beam, provides a stable, wide deck for anglers to fish from, carries a full tournament load and is easy to drive. Weight w/ Turbine Outboard 2400 lbs. 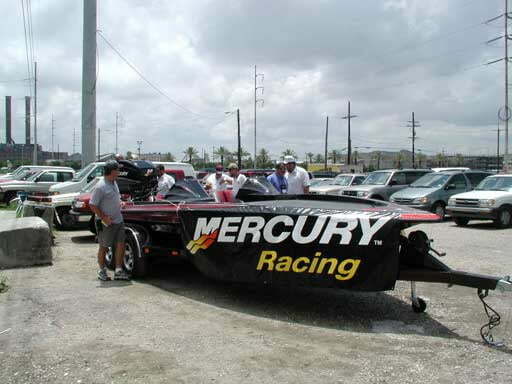 Editors: The Mercury Racing, MTT, Stroker tubine outboard-powered bass boat was displayed at various venues in and around New Orleans, August 1-4, in connection with the Bass Masters Classic.